The IDF's new Eitan armored personnel carrier. The IDF’s first wheeled armored personnel carrier (APC), the Eitan, is about to enter service. The military expects it to significantly upgrade the ability of infantry units to move from base to battle zone in little time, withstand enemy fire, and take part in combat. Together with the tracked Namer APC, the Eitan is part of the IDF’s drive to modernize its armored vehicles, make them immune to Hamas and Hezbollah armor-piercing weapons, and create new strengths on the battlefield. The IDF’s older APCs, like the M113, which dates back to the 1970s, have been found to be vulnerable and inadequate. Equipped with a 750 horsepower engine, the Eitan will achieve speeds of up to 90 kilometers an hour on roads. It will also come with an active protection system that can intercept threats like missiles and rocket-propelled grenades – the types of weapons that proved deadly for older vehicles. The Eitan is being mass produced by the Defense Ministry’s Tank Administration. 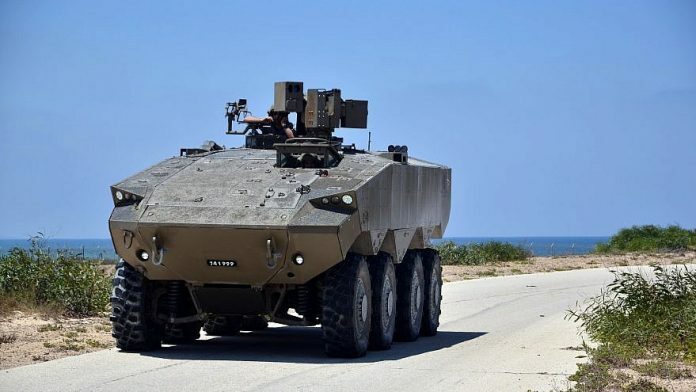 It is based on “lessons learned from Operation Protective Edge” against Hamas in Gaza in 2014, the Ministry said, when it first unveiled the vehicle in 2016. Previous articleWhy Does the Media Promote Hamas Violence?